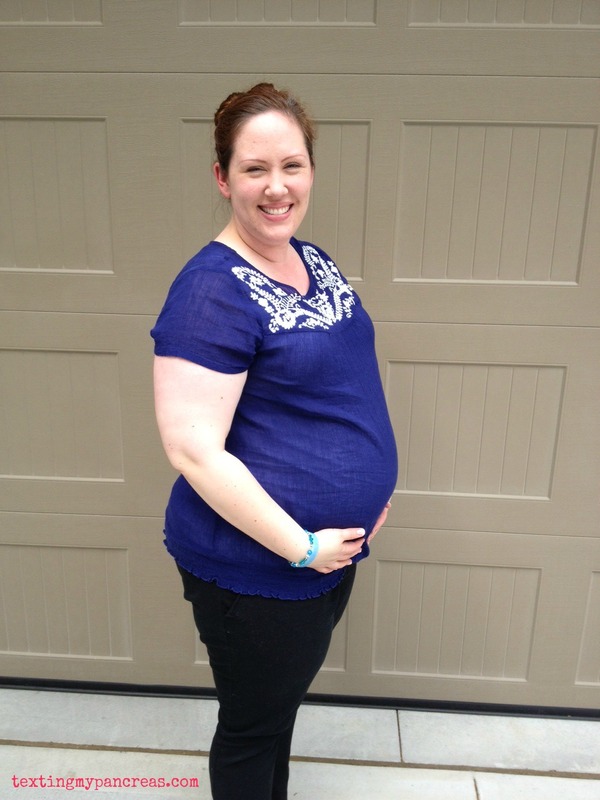 Texting My Pancreas: Week Thirty. Let's start with a bumpdate, shall we? I'm simultaneously starting to feel quite uncomfortable in my own body, yet pretty good about how that body looks. While my rib cage misses all of that luxurious room it used to have, things like random ankle swelling seem to have been a one-trick pony who has now wandered off to Montana or somewhere. The pregnancy hormones that graced me with the skin of a fifteen year-old are letting up a bit, and my inclination to care about those leg blotches seems to be inversely proportional to the temperature outside. Want to stare? Don't care. Last night marked the first time that a stranger asked with full confidence when I was due. Yay? Baby Girl finally stopped moving long enough for the doctor to look more thoroughly at her heart, which appears to have developed normally - the screening he did ruled out "about 85% of possible heart defects"
So, overall, it was a good appointment. Probably the best one we've had with him so far. I managed to spill some small ketones this morning - a during-pregnancy first - that can be attributed mostly to the fact that, what was I thinking, I actually slept through the night. Breakfast and a large amount of water intake cleared them up within a couple of hours. And as for the non-diabetes stuff, everything's coming along there, too. I'm totally amped about the upcoming baby showers our friends and family have been so kind to plan for us, and I'm swiftly becoming addicted to the smell of Dreft as I wash the baby outfits, toys, and accessories we're storing up. Packing a hospital bag (okay, two) is a thing I've started, mostly because at least having it started makes me feel calmer. And while I had originally planned to never post an ultrasound photo online (because somehow that just felt too private), I'm breaking my own rule. Her cheeks made me do it. You are both looking gorgeous! YOU ARE DOING IT!!! Everything about this post makes me smile and yes, shed a happy tear. Way to go! Awwwww! Beautiful baby and mommy! Not long now! So PRECIOUS! 3D ultrasounds are the bestest thing ever. you are beautiful! radiant! that smile! your baby is such a luscious little smushburger. you will have such a ball together! What a beautiful blessing she is! You look wonderful Kim! 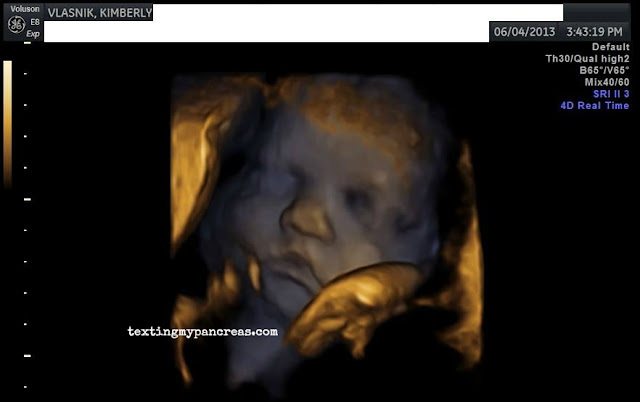 thanks for posting the ultrasound photo ... it made me smile ... soooo beautiful! Thanks for sharing on a Monday morning! It was a great pick me up! Love the picture....do you have a name yet? I'm really glad that everything is going well. Love the picture of you and that the high-risk OB came around to somewhere you're happy being. The medical imaging dork in me keeps getting distracted by all of the text framing Lil' Baby V. "Priorities, Jeff! Geez." I'm so excited for you, your husband and baby girl! Thanks for posting the photo, I love seeing how beautiful she is already!!! Kim, you look beautiful! You are glowing! Congrats and best of luck with the home stretch. Such an exciting time!